After way too much struggling with the a Final Cut Express/LiveType workflow, I’ve finally managed to upload the first in a series of videos I shot at the USGS Open House earlier in May. [ May 16, 2009; 10:00 am to 4:00 pm. May 17, 2009; 10:00 am to 4:00 pm. ] 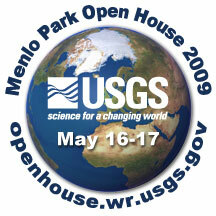 It’s time again for the 9th triennial Open House in Menlo Park May 16 and 17, from 10am to 4pm. If you have an interest in earthquakes, volcanoes, geology, energy resources or the natural history of the Bay Area and Pacific Northwest, this is the event for you.